Couldn’t believe our luck!! A really beautiful day, a little nippy to start off with but soon warmed up and showed the coastal scenery off to full advantage. 7 of us left from Widewater Lagoon – this is a man-made feature which lies south of the Brighton Road between Lancing and Shoreham. Hidden from view by houses along the road it is a landlocked brackish lagoon (approximately 1 km long but narrow) bordered on its south side by the sea defences and shingle beach. Water levels rise following high tides and heavy rainfall, but the varied levels produce a unique area for plant life and a resting place for a variety of birds including herons, swans and other wildfowl, plus an egret when we were there. “Brackish” sounds a bit dismal, but it’s actually very nice and interesting with lots of birdwatchers arriving with their ‘scopes and ‘bins. From there along the Prom towards Worthing – on our left out to sea we had a good view of the Rampion Wind Farm, 8 miles offshore and with 116 turbines which supplies 350,000 homes, which has recently been completed, with some controversy (as usual), it looks quite impressive from the shore. En route we dropped in to Brooklands Park where the boardwalk across the lake has been renewed allowing us to try this out, there is also a golf course, playground, accessible exercise equipment and walks. More improvements are in the pipeline to bring this nice little park up to date including a new cafe in due course. Onward to the Pier – and Harry Ramsden’s!! Bob went and got some of us some delicious chips and we went onto the Pier to survey the view and enjoy our lunch. 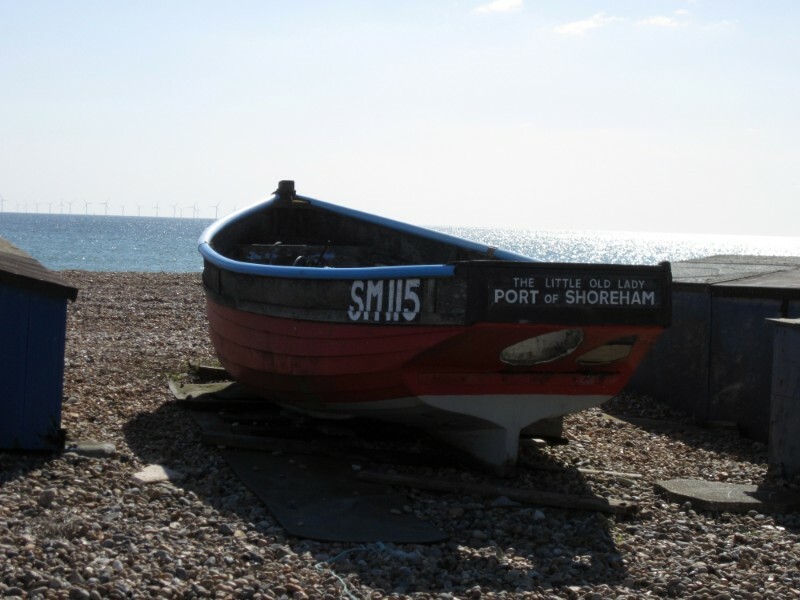 From the Pier you can see the whole coastline as far as Seaford Head and the Seven Sisters white cliffs, and Brighton and its new i360degrees viewing pod from where there is an excellent view of the South Downs and the Sussex coastline. Worthing Pier was originally built in 1861 but after a series of disasters over the years, such as storm damage, fire and general neglect it was finally rebuilt in 1949 and continues to be a source of enjoyment for residents and visitors to Worthing with cafe, amusement arcades, night club and theatre. Along the length are windows where artwork is etched into the glass, or coloured glass pictures have been made of commemorative events etc making a very colourful display as well as offering some shelter from the wind. After lunch we wended our way back to our starting point taking in all the things we had missed in the morning, it’s surprising what you see on the return journey of a linear route – I never find them boring as it all looks different going the other way – if you see what I mean! All in all, a very good day – quite a long ramble 9+ miles, but it didn’t seem that long at all. 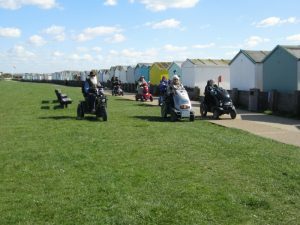 We hope to do another one from the opposite direction later in the summer, that is, from Ferring to the Pier a trip of about 7+ miles and totally different. Thanks to all for coming, and to Brian for his local knowledge and help. This entry was posted on 03/04/2019 at 10:57 and is filed under DR Rambles. You can follow any responses to this entry through the RSS 2.0 feed.